Shopping my own closet for Rachel-inspired accessories! 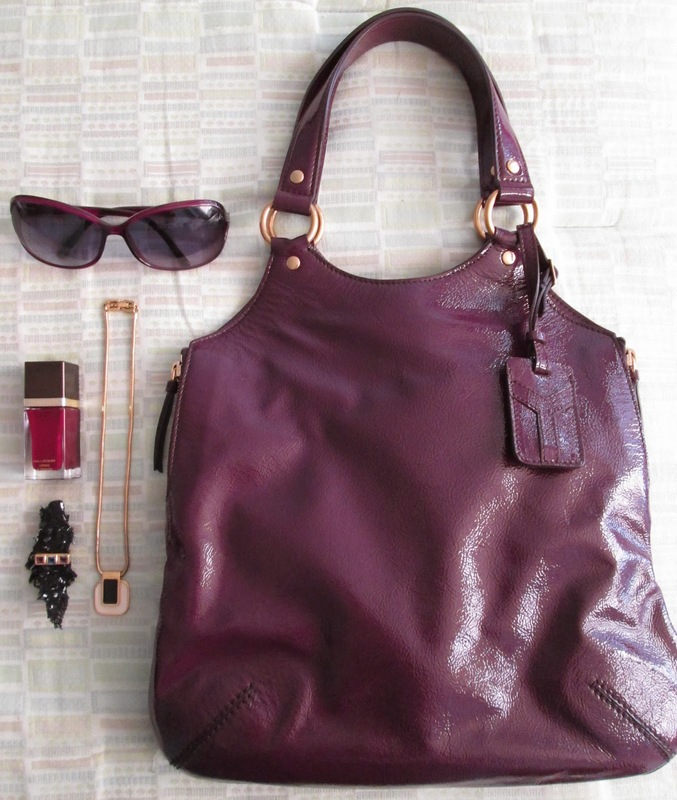 Yves Saint Laurent Tribute tote in aubergine patent. Rachel said in her first book that patent never dates. I’m with her! I know this is not the most practical bag in the world but I still love the shape and color of it. Simply Vera purple sunglasses. I picked up these Vera Wang sunglasses for $20 at Kohl’s and wear them year-round. 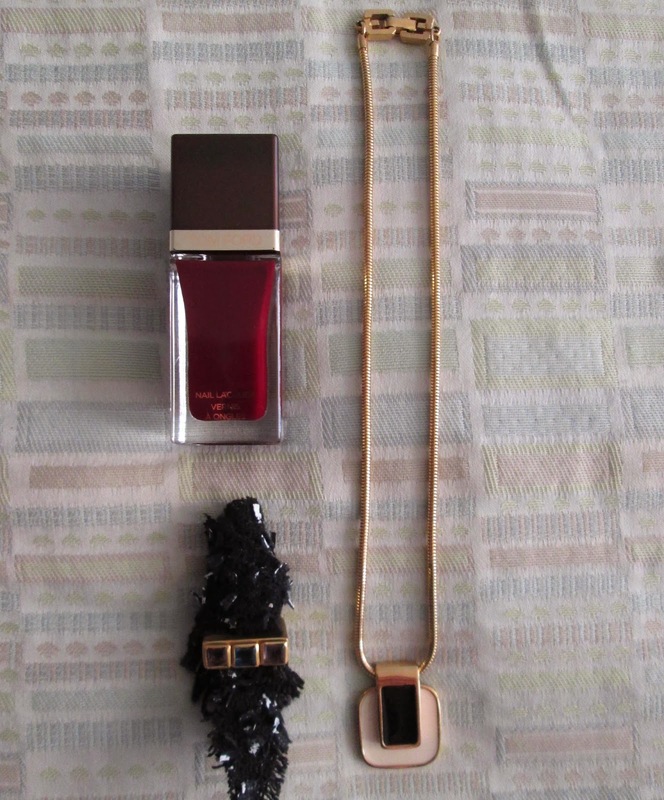 Tom Ford nail polish in Bordeaux Lust, vintage Givenchy pendant, Julie Vos Tribeca Tower ring. 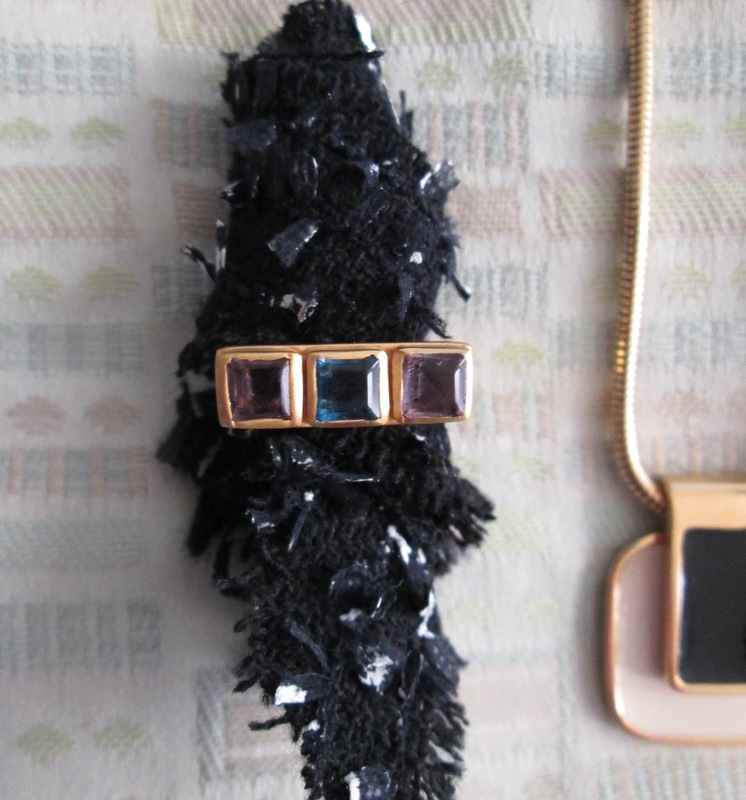 Vintage Givenchy enameled pendant on a snake chain. Rachel is a huge fan of vintage Givenchy and I think she would approve of this 1977 pendant, which I found on eBay for a song. Tom Ford Nail Polish in Bordeaux Lust. Yes, it has a bit of a price tag to it ($32, ouch), but I have been very happy with this deep red since I bought it and the quality of the polish is excellent. It makes me want to try other Tom Ford beauty products, it’s that good. Detail of the ring. The fabric holding it up is a swatch from Mendel Goldberg! Julie Vos Tribeca Tower ring in amethyst and sapphire. I got this at the recent Julie Vos sample sale, which I am so glad is over because I kept finding pieces I wanted every time I went to the site. Rachel loves a big cocktail ring and I loved how unusual this one was. 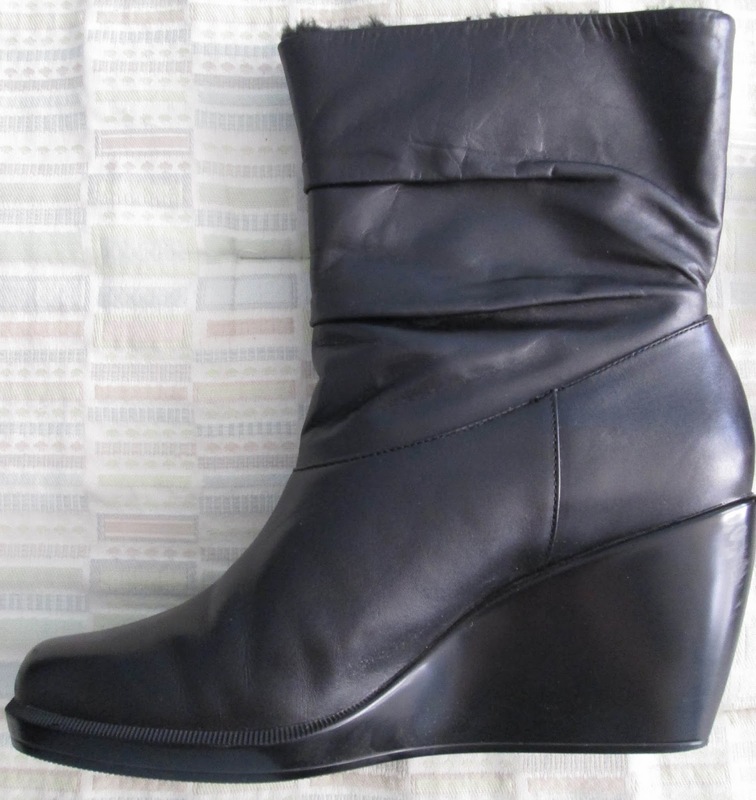 Wedge boots by Calvin Klein. Rachel loves high heels, upwards of five inches, which is just insanity in my book. I think she’d like the look of these but I’m sure she would want to add two inches to the height that’s already there! I thought Rachel’s first book, Style A to Zoe: The Art of Fashion, Beauty, & Everything Glamour, was a good mix of practical advice, personal history about how she got her start in fashion, as well as insight from designers, and pictures showing the highlights of her red carpet work on stars like Jennifer Garner, Keira Knightley, and Cameron Diaz. I hope her second book will be as fun and practical as the first. What are your favorite accessories right now? Will you be reading Rachel’s new book? I love the deep rich burgundy colours you have chosen here. That bag is especially cool. I must admit I don't read fashion books. I love going to an exhibit or something more interactive. I used to love Rachel's style, but it seems like she's gotten a little boring lately... Maybe just me. I want to read the book!! And I love the color of the bag and accessories...beautiful, Jill! Strangely I am wearing a vintage coin necklace a lot these days...it is faux, which for me is rather new as I usually only wear genuine gems and stones, sterling and gold. Scarves will be my go to accessory forever! I'd like to read this book and I like that you shopped your closet! Gorgeous! I especially love that deep rich nail color. May have to rethink my nails for this spring. Now I need to check out the book as well! Love her style, I just wish I had her hair! Please consider a nailpolish review. But when I checked the price of the TF I about keeled over......you must have a good reason for this purchase.....please tell! I love the bag, and may have to think about the TF polish. I love style books, even if I've heard most of it before. I usually pick up something. One good hint or idea or inspiration makes it worth it. I love accessories, b/c they always fit! and b/c they add interest and personality to my rather classic style. fun post Jill! I love this post Jill. You put together some beautiful items. Love the looks and how smart to shop your closet for them. I love Rachel Zoe....Maj! !